The interest in Peter Dillon’s scattered voyages lies in the fact that he solved the mystery of the death of the French navigator, La Perouse. 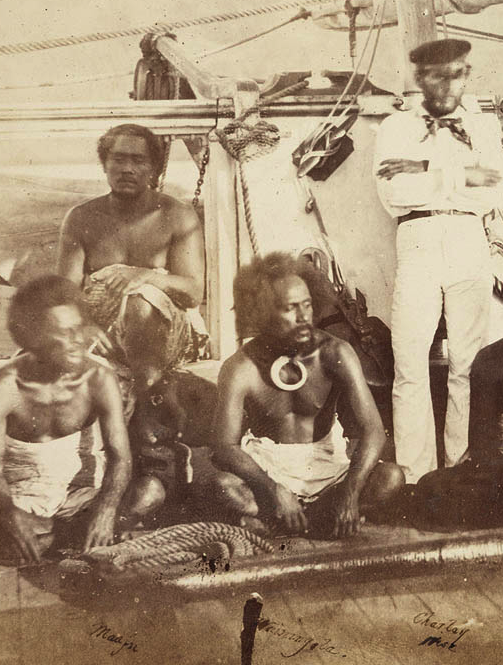 Dillon was an officer on the Calcutta ship Hunter in 1813, when it called at the Fiji Islands to trade for sandalwood and found itself involved in a punitive expedition against the Fijians. As a result of the strained situation, a man named Martin Bushart and his Fijian wife asked to be taken elsewhere. The Hunter on her way to Canton dropped Bushart, his wife, and a lascar off at Tikopia Island on September 20, 1813. July 13, 1869 : These instalments were, in fact, paid by the Polynesia Company, Limited, on July 13, 1869, and on November 19, 1870, respectively. Nine other chiefs and landowners sign: By a deed dated July 13, 1869, Cakobau and one Natika, with the ratification and confirmation of nine other chiefs and landowners, who also signed, conveyed to the Polynesia Company, Limited, certain lands at Suva to the extent of about 27,000 acres, wherein were included the 480 acres in respect of which this claim for compensation is made. In the Reports Of International Arbitral Awards Recueil Des Sentences Arbitrales Benson Robert Henry (United States) V. Great Britain (Fijian Land Claims) 2 November 1923 Volume Vi Pp. 100-104 we find reference to how Cakobau sold land to the Polynesia Land Company Limited, and thus paid debt claimed by US Government. 1. That Cakobau and his co-signatories gave a valid title in the Suva lands to the Polynesia Land Company Limited. 2. That the Polynesia Land Company Limited gave to their transferees valid titles in the Suva lands. 3. That a land warrant was a good muniment of title, whether perfected by a conveyance or not. 4. That no breach of the regulations of the Polynesia Land Company Limited had been committed. 5. That the title of the transferees of the Polynesia Land Company Limited was not affected by the fact that the payment of the second instalment of the indemnity by the Polynesia Land Company to the United States of America was made 16 months after the appointed date. We now address ourselves to the decisive question: Was the claimant Henry on October 10, 1874, the date of the cession of Fiji to Great Britain, proprietor, in his own right, of the 480 acres of land in question or of any part of them? The onus of satisfying the Tribunal on this point lies on the claimant. (4) The assignment by Jacob Brache to Charles Brache dated August 12, 1873 (memorial, p. 316); is that Henry was acting from the beginning, whether he be correctly described as trustee or as agent, not on his own behalf. In any case, the evidence falls far short of discharging the onus of proof which is imposed upon the claimant. But, further, even if it be assumed that, in the first instance, Henry acquired these 480 acres of land for himself, having regard to the facts and documents already referred to and to the sale on September 1, 1873, for valuable consideration of Henry’s 160 acres of the Harbour Block to Alfred Asbeck (answer, p. 14), we can not, in the absence of any explanation of these transactions by Jacob Brache, find ground to warrant us in making any award in favour of the claimant. The decision of the Tribunal in this case is that the claim of the Government of the United States of America be disallowed.